This will be a quick update (deadlines beckon). But the short, sharp burst of precipitation expected across NorCal later today is worth a brief discussion. 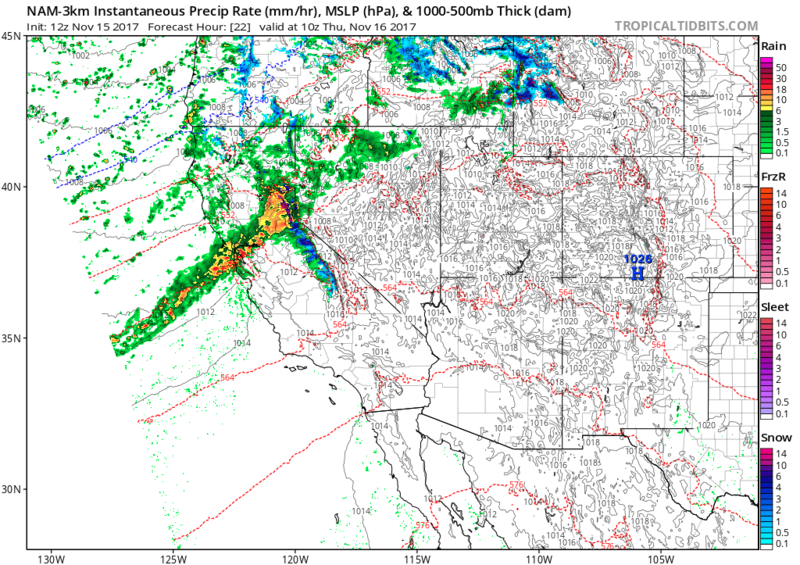 This precipitation event was foreseen a week or more in advance by long-range weather models, but it’s only in the past 36 hours or so that it became clear that this would likely become a respectable storm for many of the urban areas near the I-80 corridor (including the Bay Area, Sacramento region, and even Lake Tahoe). Why have expectations for this event been revised upward so sharply? 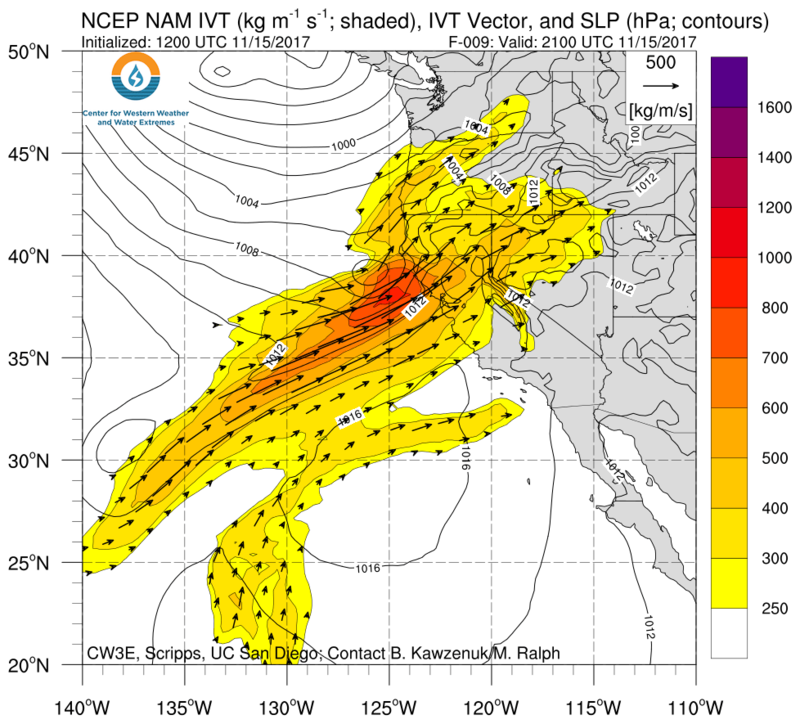 A modest atmospheric river is currently aimed at the state, which will (slowly) sweep down the coast later tonight. But in general, an atmospheric river alone isn’t enough to produce heavy precipitation and strong wind outside of very specific mountain areas subject to dramatic “orographic enhancement.” For a significant storm in California’s lowlands, there needs to be some sort of “forcing mechanism” to generate upward vertical motion in the atmosphere and squeeze out all that water vapor present in even the most robust of atmospheric rivers. Until a couple of days or so ago, no such mechanism appeared to be in place–it looked like there would be a lot of water vapor transport but not much precipitation at the lower elevations. What changed? Now, a small surface low is expected to spin up later today west of the North Coast, bringing a burst of dynamic enhancement of the water vapor plume associated with this atmospheric river as it moves southward. This storm, while not enormous, could nonetheless end up being fairly impressive for a narrow corridor near the Bay Area. Rainfall totals may be somewhat uniformly distributed across the region; while 1-3 inches is not too impressive in the coastal hills, that’s actually quite a lot in the urban areas and inland valleys. Moreover, most of this rainfall will fall over the course of just 3-6 hours–meaning that precipitation intensity could be quite high for a time later this evening. With strong vertical motion near the cold front, I would not even be surprised to see some reports of lightning associated with the heavy rain tonight across NorCal. Winds may also become strong and gusty in the typical spots, and while this is unlikely to become a major windstorm, the first wind event of the season typically brings down a disproportionate number of tree limbs and power lines. (Sierra snow levels will be relatively high, though some snow will be possible toward the end of the event at or below pass level). While a storm of the magnitude expected to blow through tonight typically would cause only minor urban/small stream flooding issues, the recent wildfire burn scars in Northern California (especially the North Bay Fire region, including the Tubbs Fire near Santa Rosa) are extremely susceptible to sudden water runoff, ash-laden debris flows, and subsequent flash flooding. The rainfall rates with tonight’s system will be quite high for at least a brief period, and there have not yet been any heavy rainfall events in this region since the devastating October fires. Thus, for this event in particular (and to some extent for the rest of winter), folks in these regions should be prepared for more sudden and extensive flood issues than would typically be experienced during similar storm events. The models have been bouncing back and forth regarding the potential for a second system next week, which would likely take the form of a relatively weak but very warm atmospheric river with a subtropical tap. The instability in recent forecasts stems from the presence (and persistence) of a very high amplitude blocking ridge over the North Pacific over the past 30-40 days, and most forecasts suggest this will persist in some form for at least another 2-3 weeks. As previously discussed, downstream impacts over California can range from ridging (warm and dry) to deep troughing (cold and wet). At the moment, the “warm and dry ridging” still appears to be the more likely outcome (especially across SoCal), though that could change. 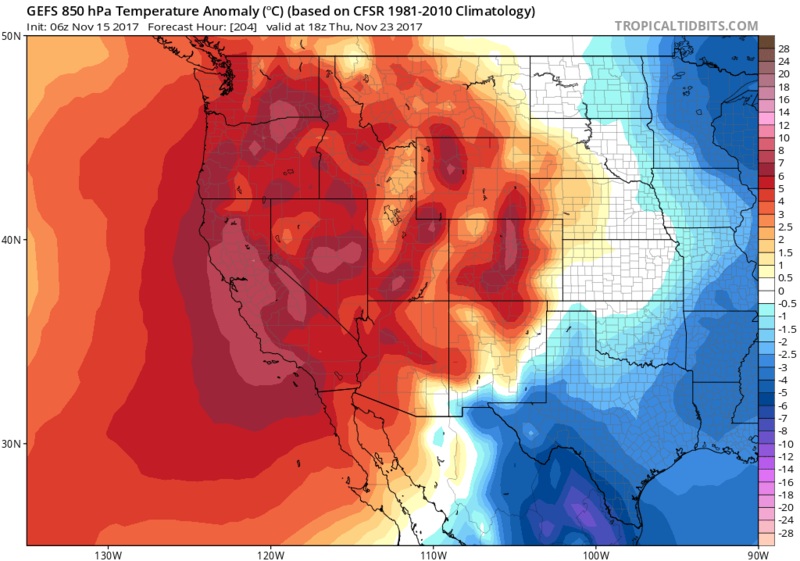 For what it’s worth, both the GFS and ECMWF ensembles currently show a very warm and dry Thanksgiving across all of California next week.